If you have a circular table that is big enough to have gaps between the seats, you can choose to space the seats evenly or group them all together. The latter is useful if you want to use sweetheart or cabaret style seating. 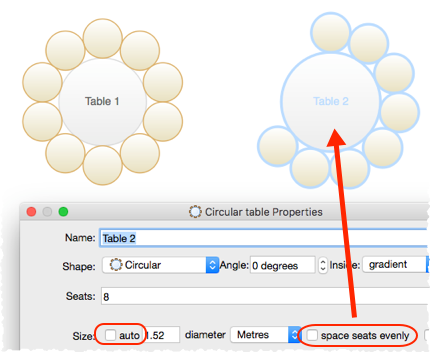 Note that grouping seats together is only possible for circular tables when there are gaps between the seats (there will be no gaps if auto is checked).